Who says robots have to look like tin cans and perform acrobatics to be fun? 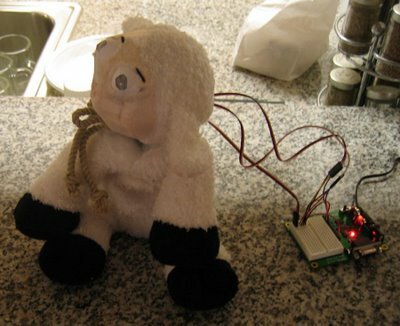 Here is a project to create a simple motion sensing robot in a fuzzy stuffed sheep. The sheep's eyes have the motion sensors and the servo-driven head turns to watch the action. It zeroes in on motion, including a breathing person, and after a time stares right at them. Says the builder, "Basically, it looks like any other stuffed animal, except that if you sit in the same place for a while, you will notice that it seems to be looking at you." I don't think I would keep it in my bedroom. I just don't like the idea of this thing staring at me all night.